This past March Hopkins presented to the public its city plan for biking and pedestrians in the city. It is remarkably comprehensive and highlights the city's focus on developing "complete streets". I attended the revealing of the plan and got to speak with the authors and some of the city staff. I couldn't find if these were available online so I recently asked on the city Facebook page and they provided the link to the plan. Here is a link to the plan, section 3 is the most interesting to me as it highlights specific problem areas and specific proposals for large problems. I'm most hopeful for the cycle tracks on 8th and Blake Road, but the entire document is impressive. 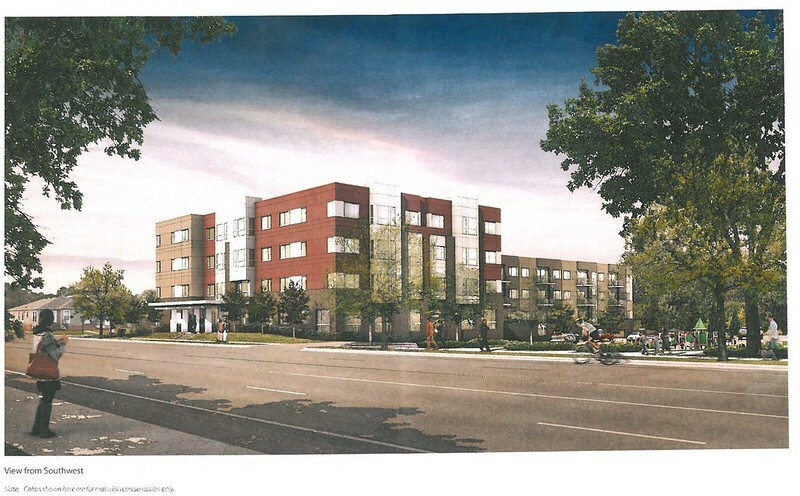 PPL proposes demolishing 6 renter-occupied duplexes in the Cottageville Park neighborhood of Hopkins, near the future light rail station on Blake Road and building a four story affordable housing apartment. Some locals are pitching a fit on the Patch website. It fits with the city of Hopkins vision for redeveloping Blake Road to be pedestrian friendly. Last edited by Anondson on August 15th, 2013, 8:41 pm, edited 2 times in total. According to the city council work group minutes PPL is calling this development Oxford Green. Will change the subject line of to thread accordingly. Foundation for the final townhomes of the Marketplace and Main project are being dug now, says the City of Hopkins Facebook page. These are ones that face onto Mainstreet, prior townhomes just off Mainstreet on 7th are finishing right now. This is an awkward lot that the city struggled to fill with an appropriate concept and the curious townhomes were the best they could come up with. Somehow retail with residences above were difficult for a developer to squeeze their cube templates into the weird lot. So this is it. These will be withing walking range of the Hopkins Downtown station. 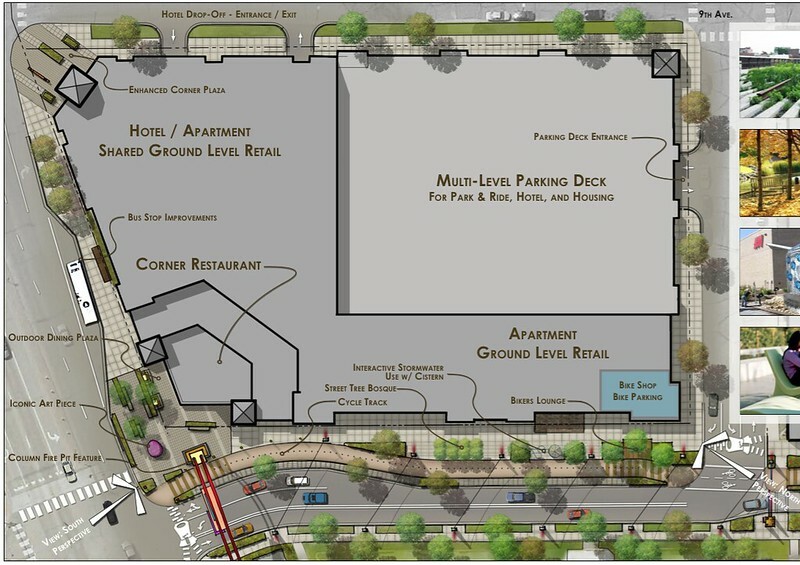 New rendering from the latest Hopkins Zoning Commission packet. A couple has proposed turning a two-lot space (one lot is vacant other has the black roof building on a larger lot) into a two story building with two commercial spaces on the first floor and two apartments on the second floor. The proposal has the couple occupying one commercial space on the ground floor and one apartment in the upper floor. Here is a rendering from the latest Hopkins Zoning Commission packet. 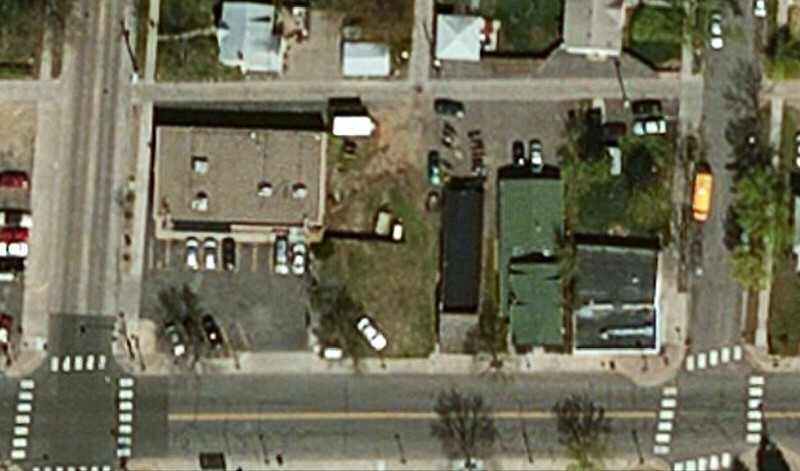 Here is a shot of the block, the vacant and underused lots in the middle are the infill lots of this proposal. Related, this proposal is a straight shot walk from the future Shady Oak Station. That area is just south of me and will look a lot different within a few years. Pages 3–10 of the council work documents show the most current concept of the Artery. Includes a cycle track linking the Lake Minnetonka trail to the bluffs trail. Eliminates most street parking. Places some kind of performance woonerf space in the middle? Surprised they are doing a one way, I thought I heard that the Mainstreet bus needed 8th. Must have found an alternate for the bus? Here are a few screen grabs from the latest Artery concept. Concept for the downtown ramp to be built for the Downtown LRT station. I hope some of the art concepts become reality because the entry arch with the fire pit is a nice idea. Mid block outdoor performance stage. Built on a table-like rise. To fit it it will remove some parking stalls from the municipal parking lot. Angled view of the stage. The Startribune has been doing a "Day Trip" feature for the past three months, once a month. Hopkins made this month's day trip. Likely free, I don't think there is any pay parking in Hopkins. 8th currently offers parking on both sides almost from Excelsior to Mainstreet. This proposal eliminates all of that except 9 spots. Except for Raspberry Festival, Hopkins never has a shortage of parking around. Losing nearly all the spots on 8th here hardly puts a dent in the supply of free parking. But it is a start. Full disclosure: I'm a reporter, but I stopped by the Hopkins City Council tonight since I live here and wanted to check out what's happening with the Artery project for my own personal interest. These are just some cobbled-together notes. I'll avoid repeating what was in the packet, but feel free to post any questions below. Here goes ..
Focus: The improvements concentrate on the west side of Eighth Avenue. There were a couple comments that the east side will take longer and that the existing apartments won't be redeveloped quickly. Price tag: It's expected to cost $2.5 million to $2.7 million. The city doesn't plan any assessments. Hopkins is requesting $1.5 million from the Met Council's Livable Communities program. It has $350,000 that it got from the sale of the Park Nicollet clinic that must be used for street improvements. It also has $400,000 Hennepin County grant that was originally to be used to buy the Snyder Drug Store property and build a parking ramp. However, that plan fell through and the city now has permission to use the money for the Artery. Utility fund money will help pay for some of the improvements. 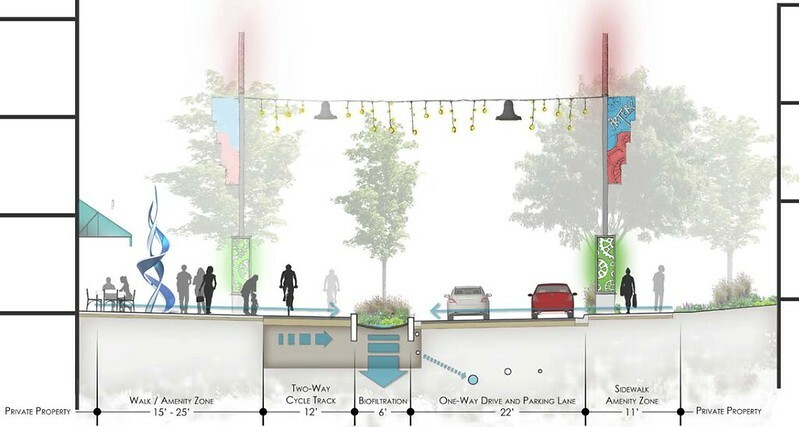 Three Rivers Park District also plans to discuss how to fit an Eighth Avenue cycletrack into its capital improvement plan, according to the city. Timeline: The city is aiming for a 2016 construction start. The City Council wasn't thrilled that downtown businesses would have to deal with back-to-back construction projects (Mainstreet improvements are planned for 2015). But staff want to be able to complete the project and make any adjustments before Southwest LRT starts. Street changes: As has been talked about since at least 2013, Eighth Avenue would become a one way. But it would only be a one way between First Street South and Mainstreet. It would remain two-way between Excelsior and First. Second Street would be blocked off at Eighth Avenue. Engineers from Bolton & Menk say that's necessary to prevent backups at the Eighth Avenue/Second Street intersection and to allow for an Excelsior Boulevard bus stop that Metro Transit wants. The mayor was not happy with this because he worries that it will force Second Street businesses to close. The economic development direct countered that these businesses have already seen interest from developers looking to take advantage of light rail. Whatever redevelopment happens on the Johnson building site, staff want it to be pushed right up to Excelsior and to eliminate the existing parking lot. They hope the future redevelopment will have some patio dining to make the street more active. As an aside, they're thinking they can redevelop the Johnson building without TIF. Public space: The street isn't just being designed as a complete street. It's being designed as a greater public space. There will be a decorative barrier that will allow the city to close off the street for events. The street is going to be flat so that the entire space will be useable. People won't have to avoid curbs when it's closed for events. I really got the impression that it's being thought of as a public space with multiple uses, not a street with nice amenities. "We close down our Mainstreet pretty often with the cooperation of the public, and this is another way we can use our public space for the benefit of the community," Kersten Elverum said. Connections: City Council members worried that it could draw people away from other amenities like Downtown Park and the art center. 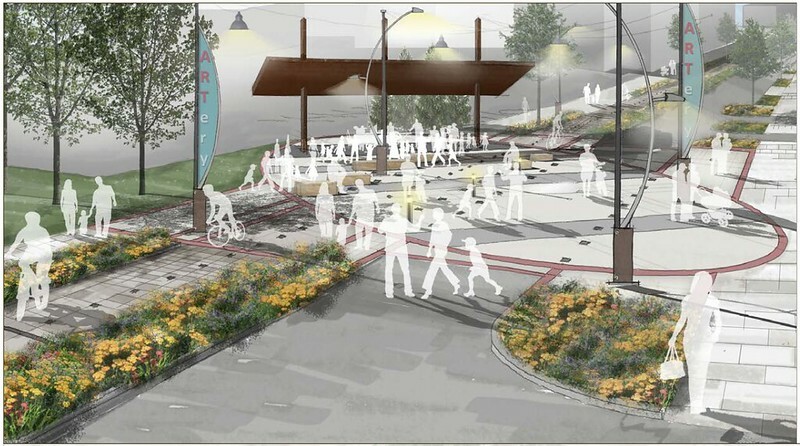 Staff said Eighth Avenue is being designed to provided connection to Downtown Park and wayfinding will direct people to the art center. Parking: There was no mention of whether it would be pay or free or why street parking is required. They moved right on to a discussion about E-cigarette rules, so I didn't have a chance to ask. Art: The public art component is being thought of as a project in itself. Staff plan a brainstorming session Aug. 25 to determine the best way to curate pieces. Council reaction: Council members made the usual comments about keeping businesses informed and making sure they could still receive the necessary deliveries. Aside from that, everyone but the mayor was largely positive. Mayor Maxwell, though, was pretty down on the idea. I already mentioned that he didn't like closing off Second Street Access. He also questioned why Hopkins needs a second band shell when it already has one at Downtown Park. He thought proposals to have water features were impractical since they'd only be used for "four months of the year." Overall, he worried the project was too trendy and wouldn't stand the test of time. Going forward: Staff and consultants will be meeting with property owners and businesses in the area soon, mostly one-on-one. The city had planned a tentative public open house Sept. 2, but that's now looking more like it'll be October. Staff will also be talking with artists. In the spring they plan a three-day "tactical visualizing" process. They'll do temporary installations on the street to get a feel for what works and what doesn't. Thanks for the write up, I almost went as well but my yard work couldn't be out of any longer and it won out. I know the work session is open to the public but I've always felt awkward to sit in. Your post seems family detailed, I'm not sure what more question I'd have! It's nice to have the perspective of the old guard, skeptical of change, that the mayor is bringing. But I think he's off on this. I expect the 2nd street businesses will be redeveloped sooner than later and the owners won't be complaining at the offers for their property. The "flat space as the street" is one of the cues I am hoping the Mainstreet project takes and uses, but I don't think it will come to be and Mainstreet will be far more conventional. I don't think the council is actually serious in their worry that this will draw attention from the other amenities of the area otherwise they would have stopped this in its tracks long ago. Because it sounds almost "Minnesota modesty" in a way of being embarrassed to have too many nice things. It's not like the stage space on the Artery is taking up dead space like it does in the park and can't be used for anything but performances, there is a bike trail and a sidewalk running right through this one. A second performance stage is not a negative. I'm glad the rest of the council was positive, but hearing the Mayor so down on it has me motivated to attend the open house whenever it happens. I attended the council meeting last night where SuperValu presented very plain drawings of a planned expansion at their Hopkins facilities. With their Eden Prairie location lease ending the company is relocating certain operations around and SuperValu is proposing sending their 44-person test kitchen labs is going to the Hopkins site. The test kitchen labs are proposed for the complex west of 169. There are some existing offices on the side facing 169, adjacent to 2nd south. The new test kitchen labs will replace the current outdoor patio space. There is already a large surface parking lot and seemed to be no expansion in parking. This ends up being within walking distance of the proposed downtown SWLRT station, fwiw, so I wonder if SWLRT boosters could count this the way the Green Line added up every development that happened to be within range. Business Journal reports the same thing. Hopkins Tavern was changed to Pub 819 in the past few months. It got a rather favorable review in the Strib. Mainstreet got some attention, too.